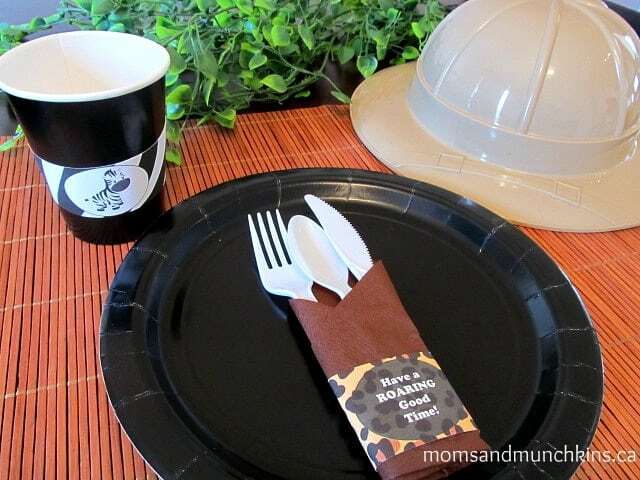 One of the coolest birthday parties you can plan for your little one is a safari theme. 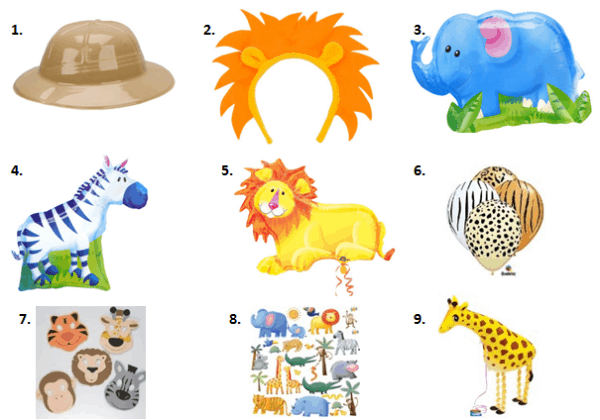 Decorations for a safari theme are easy to find and there are so many fun activity ideas. Here you’ll find ideas for invitations, decorations, activities, food and treat bags. There are also loads of free party printables! I hope your party is a ROARING good time! 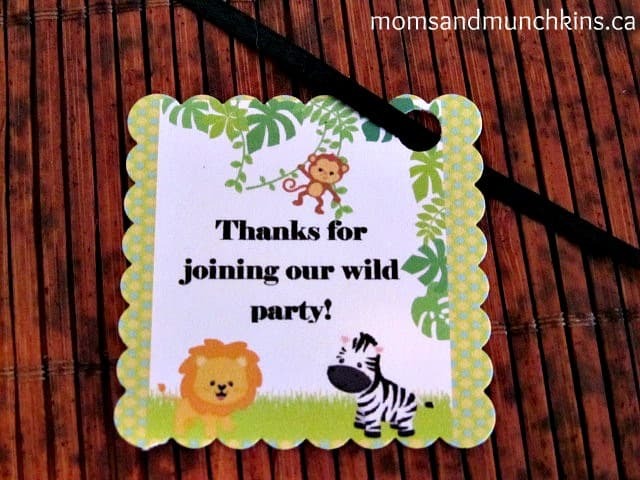 If you are the crafty type, a passport style invitation is a great idea for a safari theme party. In your passport invitation you would include the destination (location of the party), date of departure (date & time of party) and a reservations number (RSVP details for the party). 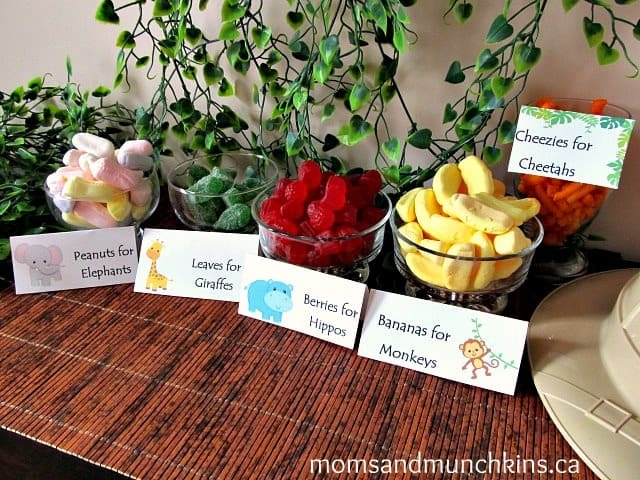 Safari themed parties are so easy to decorate for since there are so many safari print decor items out there. 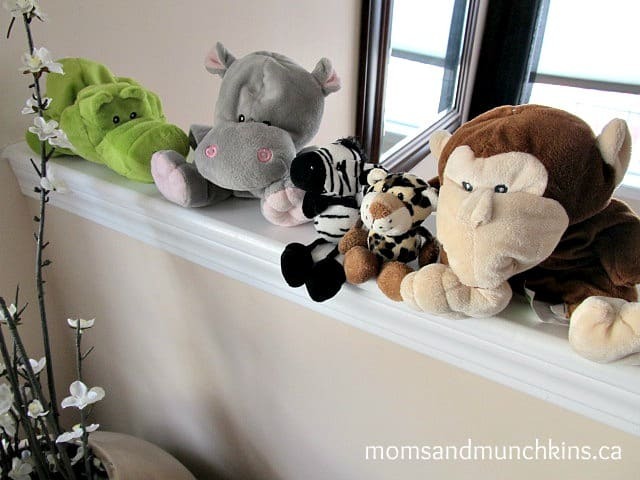 You can place stuffed animals around the party area, hang plastic vines or green & brown streamer paper to look like vines and hang monkeys from doorways and light fixtures. 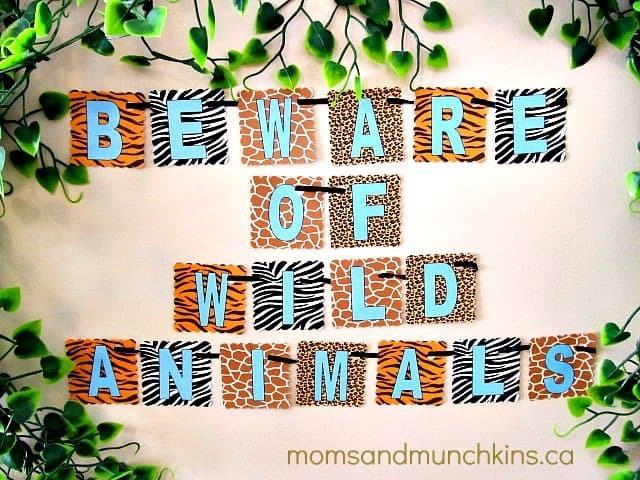 Click here to print the free “Beware of Wild Animals” banner below. Hang this by the entrance to your party along with some plastic vines from your local dollar store. A fun idea is to greet guests with safari gear upon their entrance to the party. You could include things such as a pith helmet, safari masks, toy binoculars and a toy water canteen. The kids could take these items home with them as part of their treat bags. You can create your own small safari ride using a wagon or other ride along toy. Before the safari trip, you can invite the kids to fill a small bag with treats for the animals that they may see during their tour. The safari animal feed could include items like marshmallow peanuts for the elephants, marshmallow bananas for the monkeys, spearmint leaves for the giraffes, cheezies for the cheetahs and berries for the hippos. You could include inflatable safari animals hiding behind plants or up in trees during the safari tour. Scavenger hunts are always a fun game at birthday parties. You could create a fun scavenger hunt for the kids including challenges to complete along the way. Once the guests all arrive, you can let them know that the birthday cake has gone missing and you require their help in order to find it. Provide the kids with their first clue and set them off on a safari adventure to find the cake. Did you know that baby giraffes are 6 feet tall? Using these boxes, blocks and measuring tape, create a 6 foot tall tower. The tower must stand alone without help for at least 10 seconds in order to receive your next clue. Fill an area with green and blue streamer paper on the ground along with a few stepping stones from one end to the other. You can even toss in some rubber snakes in with the streamer paper. The challenge will be for each child to walk through the “swamp” by stepping only on the stepping stones and not on the streamer paper (the swamp) – beware of snakes and alligators! Did you know that the cheetah is the fastest animal in the world? It can run up to 120 km/hour. For this challenge, the kids must race from one end of the party and back again as fast as they can. You can award the fastest runner with a special treat. Once all of the kids have completed their cheetah training exercise, they can receive the next clue. Hang paper or plastic bananas from a tree and have the kids pick them all in order to receive their next clue. Fill a safari animal themed pinata with candy and have the kids break the pinata to receive the candy and their next clue. I’ve created some zebra and leopard rings that can be printed and used as napkin rings or as decor for paper cups. Click here for the free zebra rings and the free leopard rings. An animal shaped cake is a fun idea for a safari party. Animal shaped cake pans are the perfect tool for creating animal cakes. 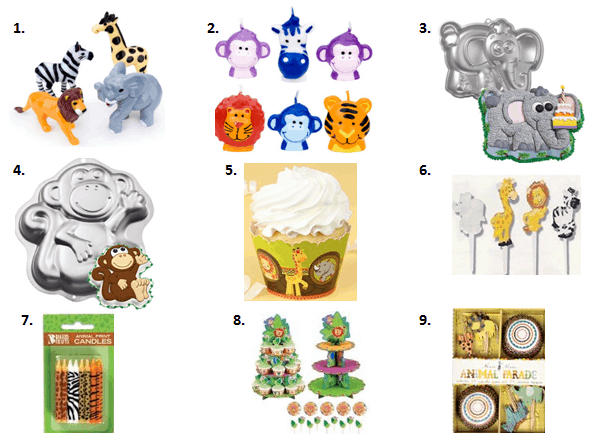 If you’d rather serve cupcakes, cupcake picks and safari wrappers are an easy idea. If you love decorating cupcakes, try these cute ideas by Betty Crocker. 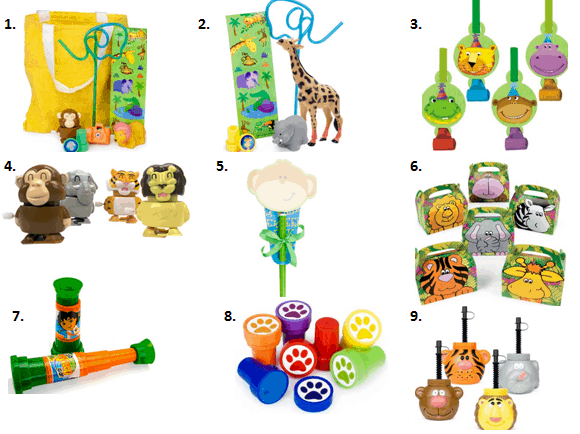 These free safari printable treat bag tags can be printed and attached to your little safari treat bags. If you provided the guests with safari gear upon their arrival to the party, your treat bags will be close to complete already! Here are some great ideas for treat bags & treats! What’s your favorite safari animal? **Disclosure: I am part of the Amazon, Big Dot of Happiness, Birthday in a Box and Tiny Prints, Inc. affiliate programs. Digital paper and characters by Pixel Paper Prints. You are so creative, I am so glad I found your site as I am not creative at all! Thank you as this is a great idea for a nice summer party we are planning. What a sweet comment – thanks! So many awesome ideas! This post must have taken you a long time to put together, nice work! 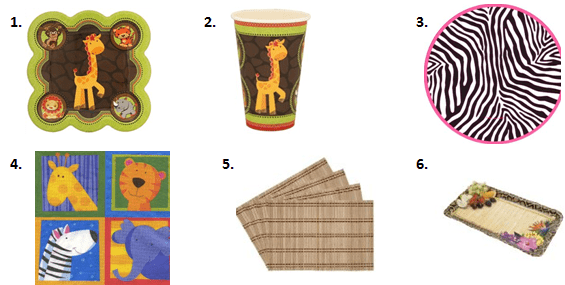 I love the totally adorable printables and the animal food is so perfect! LOVE it! Ahhhhh, we are in South Africa… 🙁 I am so so upset that all the most amazing things you have used are not available here…) Such awesome ideas well done!!! Love this. Doing my great grandson party in zoo theme. Where can I find the banana candy. Hi Valerie! If you have a bulk candy store in your area, I find that’s the best place to find a variety of candies. The local Bulk Barn (Canadian brand) is where I found these banana candies. I hope you have a great party! Great party.I would like to know if you still have a copy of the labels for the candy dishes as I am hosting a safari baby shower and love the ones you have. How do you print the “Beware of Wild Animals” banner in a big size like that? When I tried to print, it’s just a small size, no matter what size of paper I use. Thanks!